An attractive blend of our red-blushed and green bibb lettuces. A wonderful salad mix. Lettuce, Bibb Blend is rated 4.5 out of 5 by 2. 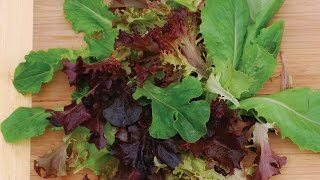 Rated 5 out of 5 by flooze from Love This Lettuce It's nice to have a lettuce mix without buying 1,500 seeds of each variety. For a family of 4 salad eaters, recommend planting 12 seeds every 2 weeks for a constant flow of fresh product. We live in Maine and started indoors mid February and were eating fresh greens 10 weeks later. Seed success rate is high and it's nice to have a surprise about what type of lettuce will be produced. 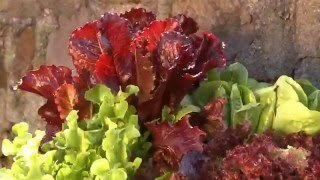 We're very cost & space conscious about our growing space and materials and you can literally grow this lettuce in large window sills in cut down gallon mild cartons or large plastic coffee containers. This is a great planting project to get your little ones to eat greens early in life. It's easy and fun for toddlers to teens to grow and harvest. We'll continue planting outdoors now that the weather permits throughout spring & summer. Rated 4 out of 5 by Corni from Love the lettuce...so did the bunnies The seeds started easily indoors and I transplanted them in early April. They acclimated well. But the bunnies did a number on them since they were the only thing in the garden at the time. The plants that I saved grew beautifully. However a few days before I wanted to harvest in early June, I made the mistake of an evening watering and that brought the slugs out. They desimated 1/2 a head in one night. What I did eat tasted wonderful and provided really nice sized heads. Next year I'll double what I put in the ground so I make sure I enjoy it instead of the critters.